When I planned to start classes for ‘Spoken English’ for ladies, I had a fairly good idea of how to go about it. When I got an enthusiastic response from a heterogeneous group, I was happy on the one hand and apprehensive on the other. Some of them seemed to fit the bill as ideal student material with a little background in English. Others made up for their deficiency with their keenness and enthusiasm – they spoke nineteen to the dozen – in Hindi of course – that they were ready to continue – even for a year – till they learnt to speak English. It was heartening; it was even more challenging. When I started the classes, I came upon stumbling blocks but with a vehement determination not only on my part but also on the part of my eager students, we trudged on hand in hand – progressing slowly but steadily. Then there was no looking back. What was imperceptibly apparent was that everyone understood - at least to a great extent - what I was speaking – in English of course. If any of them gave a quizzical look I would reframe my words. If they still didn’t follow, one of their friends would translate it in Hindi. I would turn a blind eye and a deaf ear – my students were probably under the impression that Ma’m wasn’t well-versed in Hindi! It suited me fine. But when I started teaching tenses I started explaining each tense with examples in Hindi so that they would understand better. It was a revelation to them! They had teething troubles with subject-verb concord – especially in the present tense. Initially I kept stressing the drill practice as they stumbled. Soon some of those who had mastered it, enjoyed offering corrections. A handful of them were brimming with enthusiasm – they would discuss the class lessons for a good 15 minutes at the parking lot before dispersing to their houses! They even went a step further – they’d gather at one home for an hour on the non-class days and practice English. Isn’t it really heartening to have such sincere students – mind you – not the regular ones but ladies – home-makers - who have their hands full all 14-15 waking hours of the day?! One of them even started having dreams of our classes! Another would be so lost in her own world of English practice that her husband would have to jiggle her back to reality. A couple of them took my advice of ‘practice-conversations’ with family members so seriously that they got an earful from their kids who got very irritated at the long time their mom took to give them an answer in English. Others were better off – their kids were thrilled to help their mommies out! Some of them followed my ‘absurd-sounding’ advice seriously – they talked to themselves in English as they did their chores - when no one was around at home! There were some funny moments as one of them would start a sentence in English, pause halfway through and ask for my approval. Another would try to modify her sentence and the former would change her half-sentence and ask me, ‘Correct?’ I would give a quizzical look and ask, “What do you want to say?” The others would burst out laughing saying, “We’ll make Ma’m forget her English”. Jokes apart, my students have graduated to correcting themselves, correcting others and best of all, speaking grammatically correct English. On the flip side, in spite of my repeated requests that they should use English whenever they could and at least wherever the group met, they would make an instantaneous switch over to Hindi / Marathi the moment they crossed the ‘Lakshman Rekha’ (my front door, what else?) – even as I stood there to wave them goodbye! During the class, some would talk in monosyllables – I concluded that they were the reserved type. But there were times when they asked me for permission to switch to Hindi. When I gave the green signal, they indulged in what seemed an endless chatter! It was English that had rendered even the garrulous tongue-tied! There were days when one or two couldn’t make it to class. The reasons - ranging from sick mother-in-law or stay-at-home kid / guests / celebrations …. to unavoidable chores / errands - were all perfectly valid. Sometimes they wouldn’t get time to complete their homework - again for perfectly valid reasons. I tried to motivate them more with a simple tactic – and it worked – yes, even with these adults. Yes, I gave 1-3 stars for their homework. The next class saw all of them vying to show me their homework! It was heartening to see the child in my adult students. Well, I told you at the outset that I have a heterogeneous crowd – a few newly married; some in their late twenties; many of them middle-aged and a few in their fifties. Some of them were the mothers of my ex-students in College. A couple of them were in their 5th month of pregnancy when they joined. We appreciated their keenness – in fact we felt it was a double whammy for them – not only they but also their unborn ones were learning to speak English! Remember the recent news item about ‘Womb Tuitions’ - classes for pregnant women – to stimulate the brain of their Abhimanyus and to increase their IQs? On the other hand there were a couple of drop-outs too. The ladies in each batch hailed from different states of India but they were all from the same neighborhood and some of them were already acquaintances. 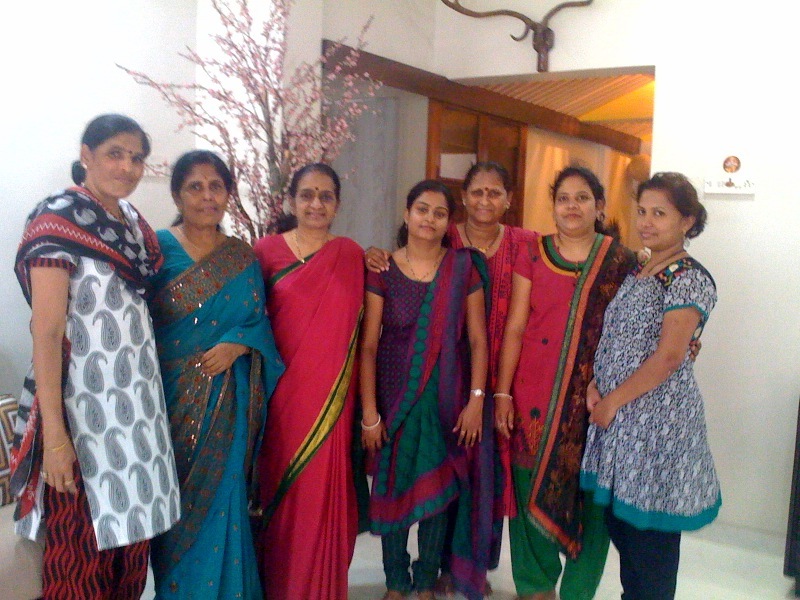 The group became one ‘BIG’ happy family as they bonded well – what with practice conversations on a variety of topics – about their school life, college life, parents, grandparents, home, family, friends, tours and celebrations. I had never anticipated that the classes would also lead to emotional attachment! There would be gentle ribbing – once the only lady in the batch with a single kid was being brainwashed by the others to try for a second child. During another conversation session, my students took us through a sea of emotions from laughter at their follies as kids to compassion and pity at their distressed childhood. A couple of ladies narrated about their marriage at the tender age of 17-18 and the adieu they bid to books. Another was lucky to get a chance to go to College, thanks to her yet-to-be-married elder sister – you see the parents didn’t want to have two daughters of marriageable age at home; at least they’d have the satisfaction to declare to the world that the younger one was going to college. One gave a graphic description of how she confronted robbers at home and her trauma; another gave a suspenseful narration about misplacing her ‘loaded’ (don’t misunderstand – it was loaded with jewels) purse at a hotel in an unknown place during a road trip and realizing it at the end of the day after driving some 250 kms! The story turned out to be an edge-of-the seat thriller! One student stirred our hearts by narrating how she had to balance between College and home with a paralyzed mother who needed her love and care. Yet another brought tears to our eyes as she described her impoverished childhood, her inability to go to school and how she managed to learn from a neighbor without her father’s knowledge and eventually managed to pass her SSC. We couldn’t help admiring her for her guts to complete her graduation and also making a mark for herself – not only is she now well off with a well-settled husband and two lovely kids but also engages in a lot of activities highlighting her versatility! That was one unforgettable class when emotions ran high. So you see apart from serving the primary purpose, my Spoken English classes have turned into a personal-bonding social site, ha ha! As in any teaching situation, there is a lot of give-and-take. I learn the various angles in which my students view topics and keep incorporating precious additions to my teaching points! Considering the fact that fluent speakers of English have taken years to master it, these ladies have made admirable progress in a matter of months.